Wood ducks depend upon forested wetland habitat for food and cover, although marshes are also used. Breeding range must have trees for nesting cavities and food near permanent freshwater lakes and streams. Brushy borders are important for nesting and brooding. Swampy areas with cypress and gum are premium for roosting. The best habitat contains mastproducing hardwoods that border streams and permanent fresh-water lakes. Many beaver ponds provide ideal wood duck habitat. The diet of the wood duck includes hard and soft mast, insects, aquatic invertebrates (mollusks, snails, etc. ), aquatic plants and seeds. Mast is the fruit of trees and shrubs, such as acorns, nuts, & berries. Wood ducks feed on land considerable distances from open water. Nesting habitat requires areas of flooded shrubs, trees, or both, in approximately 1:1 ratio of plant cover to open water. Trees or shrubs overhanging water will suffice. Cover should remain available from February through May. Nesting cavities should be within 1⁄2 mile from water. Mature trees of 16 inches in diameter or more are the primary source of cavities, although nest boxes make a good substitute. Maintain at least one cavity for every 5 acres of woodlands. Adequate food must be available. Nesting requires cavities or nest boxes. Wood ducks prefer to use cavities already made by woodpeckers and squirrels, although any cavity is acceptable. The entrance should be no larger than 4 inches and the cavity large enough to support an average of 11 young. Protecting previously used nests is very important. Once successful, a female will nest in the same cavity year after year. Figure 1. Wood duck nest box construction. Figure 2. 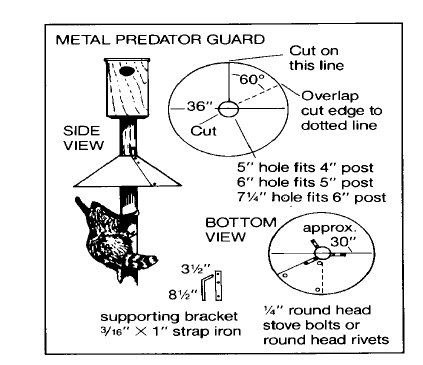 Predator guard or nest box. Due to the migratory and mobile nature of the wood duck, home range is difficult to define. The average feeding radius is 25 to 30 miles every day. Annual migrations reach hundreds of miles. Because of the mobility and migratory habits of waterfowl, home range is not a consideration in forest habitat management except in terms of the brood-rearing and nesting requirements discussed above, and feeding radius. Plant mast species in wetlands areas. Many game and nongame species with habitat requirements similar to wood ducks benefit from wood duck management. Management plans should emphasize the community of species that share wood duck habitat. Species that benefit from wood duck management.